… An outstanding pedagogue, musician, and pianist. … An excellent pianist and an inspired performer. Her pedagogical talent is exceptional and is supported both by her musical qualities and her knowledge and experience on the human plane. György Sebök, Distinguished Professor of Piano, School of Music, Indiana University. 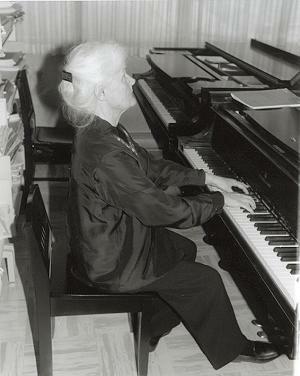 Bratuz was the first Italian citizen to earn a Doctor of Music degree [in Piano Literature and Performance], and the first woman to earn that degree from Indiana University, where she studied with, and later assisted, the distinguished pianist Gyorgy Sebok. “ŽIVLJENSKI JUBILEJ – Damjana Bratuž. Z glasbo po svetu.” This article (in Slovenian) entitled ”A LIFE’S JUBILEE - Damjana Bratuž. With Music Around the World” appeared in a daily newspaper in Damjana’s home town, Gorizia/Gorica, on July 31 2012. It was written by renowned author, documentary film director, and journalist, Dorica Makuc. It celebrates the accomplishments of the musician, pedagogue, and lecturer, who has remained faithful to the memory of her family’s sufferings and has received in 2011 the honorary citizenship of the city of Urbisaglia. 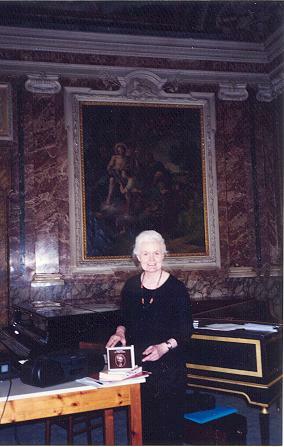 In one of the pictures appearing in the article, Damjana is shown with celebrated composer and painter Cecilia Seghizzi, her Theory and Music History teacher of the 1940s who is now 103 years old. Damjana visited her in 2011 at her summer residence in Grad. The broadcasts inspired several listenrs to call and congratulate. The Honorary Citizenship of Urbisalgia is being awarded to Damjana Bratuz in memory of her father Rudolf, who in 1941-42 was interned in the nearby Campo di Concentramento. At the Cultural Centre Lojze Bratuž in Gorizia, Italy, an evening was devoted on May 13 to the memory of a prominent local musician, organist and composition teacher Emil Komel. The organizer of the event, musicologist Tatjana Gregorič, invited Damjana Bratuž to send from Canada her own reminiscences, which were read at the event by a young colleague. The program, with the participation of eminent musicians including conductor Anton Nanut, and prof. Ivan Florjanc, was recorded by Radio Trieste-A. 2012 - London, Ontario. The London Opera Guild. The Feminine Side of the Musical Mind. Kaija Saariaho: L’amour de loin/Love from Afar. 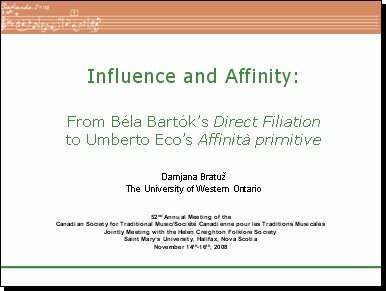 2008 - Halifax, Influence and affinity: from Béla Bartók’s direct filiation to Umberto Eco’s primitive affinities. 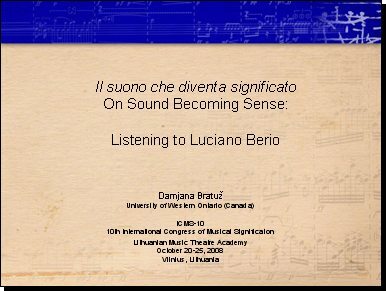 2008 - Vilnius, Il suono che diventa significato/ Sound Becoming Sense: Listening to Luciano Berio. 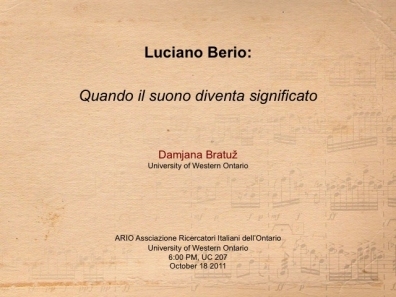 2007 - Toronto, Luciano Berio: “Quando il suono diventa significato. On Sound Becoming Sense. 2007 - Toronto, Bartók’s Blunder: the Missing Frontier. 2005 - University of Calgary, A World of Contrasts Commemorating the 60th Anniversary of Bartók's Death. In 2003 David Stabler's three-part series Lost in the Music was short-listed for a Pulitzer prize. "He lives in southeast Portland ... and has three children, two bicycles and a cat." Jason Blake is a professor in the Department of English at the University of Ljubljana. I thank Damjana Bratuž for her help with the "Italian Gould," including her thoughts on literal and cultural mistranslations that may account for past biographical confusion. 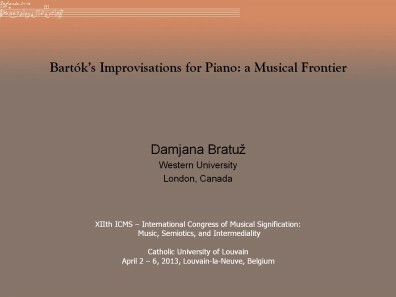 Paper: “Bartók’s Improvisations for Piano: a Musical Frontier.” ICMS- 12, Music, Semiotics and Intermediality. Université catholique de Louvain, Louvain-la-Neuve, et Académie Royale de Belgique, Bruxelles. 2 - 6 avril. 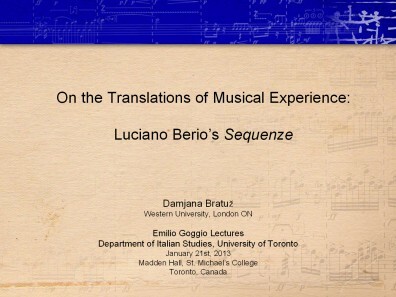 PowerPoint presentation: “On the Translation of Musical Experience: Luciano Berio’s Sequenze.” Emilio Goggio Lectures, Department of Italian Studies, University of Toronto. January 21. London, Ontario. The London Opera Guild. The Feminine Side of the Musical Mind. Kaija Saariaho: L’amour de loin/Love from Afar. 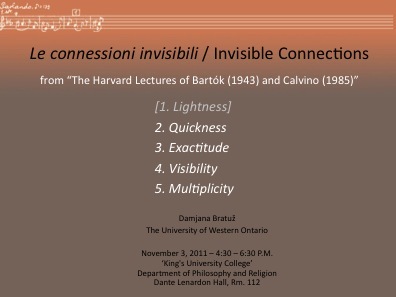 Invisible Connections: The Harvard Lectures of Bartók (1944) and Calvino (1985) - King's University College - Department of Philosphy and Religion, London Ontario. PowerPoint presentation. 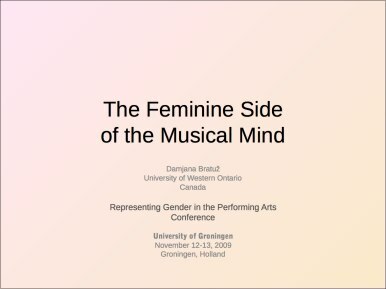 International Conference: Representing Gender in the Performative Arts , University of Groningen, Groningen, The Netherlands. 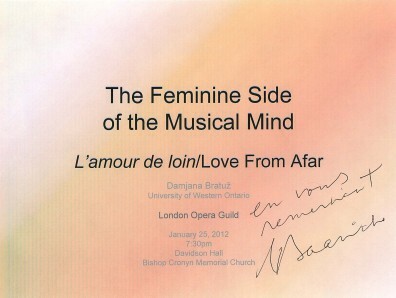 (Keynote Speaker) The Feminine Side of the Musical Mind. 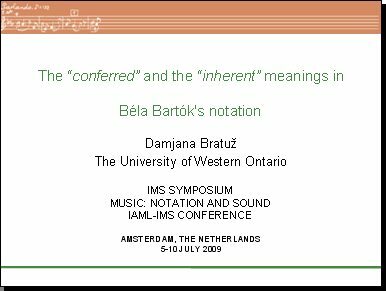 IMS SYMPOSIUM MUSIC: NOTATION AND SOUND IAML-IMS CONFERENCE The “conferred” and the “inherent” meanings in Béla Bartók's notation. "Thank you so much for your fascinating and engaging talk on Saturday. I know the discussion could have continued for much longer because of the interesting aspects you brought up". "This will be a treat! 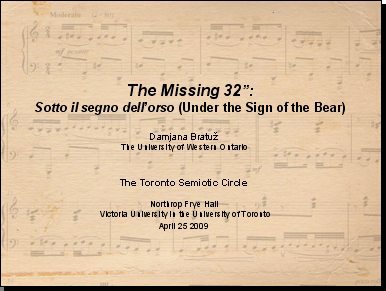 Prof. Bratuz is a delight and has much to teach us about singing in Italian… "
Colloquium Paper:”Bartók’s Blunder: the Missing Frontier.” The Toronto Semiotic Circle. Victoria College, Northrop Frye Hall. "MUSIC, SENSES, BODY” “LA MUSICA, I SENSI, IL CORPO"
… Bartók scholar Damjana Bratuž, presented in an interesting way his mistaken notion about the total germanization of Slovenian music…. Damjana appeared on the television program OPUS, conducted by Darja Korez Korencan, who interviewed her for Slovenian Television. Profile: Damjana Bratuž is Professor Emeritus at the University of Western Ontario in London, Canada. She is one of the country’s three musicians (with Zoltán Székely and Árpád Joó) who were awarded the Bartók Centenary Diploma and Memorial Plaque by the Hungarian Republic. 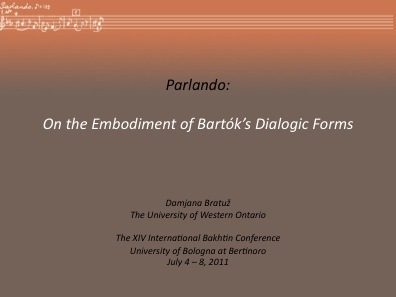 It was at Indiana University, where she obtained a doctorate in Piano Literature and Performance, that Damjana Bratuž began her earliest investigation into the presence and significance of the folk element in Bartók’s music. In these past seasons she has presented papers in Bartókian musical semiotics at international conferences, most recently at the Lyrica Society in Washington, D.C. (Transgression without Threshold: on the Prologue to Duke Bluebeard’s Castle,) at the Sorbonne in Paris (Gestures of Lament), at Goldsmiths College in London (on Bartók’s Sound-Spectrum), as well as in Leuven (Belgium), Imatra (Finland), Bologna, and at the University of Chicago. Her larger interdisciplinary projects have been structured and offered in various formats: The Harvard Lectures of Bartók (1943) and Calvino (1985) at the Universities of Ottawa, Toronto, Bologna, and Auckland (New Zealand); Comme de longs échos: Reflections on Bartók, Rilke and Brancusi, at Indiana University, in Budapest, and at the Accademia delle Belle Arti in Bologna. Musical Performance and the Dialogic Imagination was given as a series of ten seminars at the University of Helsinki. Professor Emerita Dr. Damjana Bratuž gave an illustrated lecture and performance at the University of Calgary. On the Shaman’s Trail , was part of a three-day Bartók Festival, “A World of Contrasts, Commemorating the 60th Anniversary of Bartók’s Death,” sponsored by the Hungarian-Canadian Cultural Association in Calgary. One of the organizers was Kieth Mullback, BMus’72 . In recent seasons, Dr. Bratuž has also presented papers at the Sorbonne, Paris, [Gestures of Lament: the ‘Sostenuto e pesante’ Movement in Bartók’s Piano Sonata] and at the University of Chicago [Bartók’s “only really true notations…” ]. Her article “Folklore and Transcendence” in memory of Yves Lenoir, the late director of the Bartók Archives at the Royal Library of Belgium, has appeared in the RevueBelge de Musicologie (Vol.LVIII, 2004). Performer, perhaps, is a modest description for Western Professor Emerita Damjana Bratuž. For Bratuž, the joy she receives from her music, in particular the work of composer Béla Bartók (of whom she is a worldwide authority) was not always at the forefront of her life. Born in Italy, near the border of Austria and Slovenia, Bratuž grew up in the shadow of dictatorship, suffering under the reign of Mussolini and the Nazis. 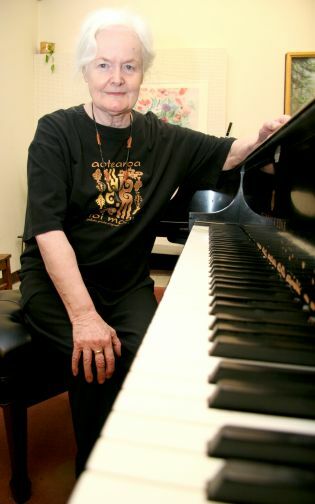 "As a pianist I didn't develop easily or smoothly because of the war," says Bratuž. "I was very gifted but my formative years were during the war. I started at six, but they were horrible times." She would find her way to America thanks to a Fulbright Award, to attend Indiana University where she hoped to study radio and television. It was here that her true talent was discovered. How true that statement was. She would go on to become the first woman to receive a Doctor of Music in piano literature and performance from Indiana University. One graduate of Bratuž who admits he was skeptical was David Stabler (MusB'75). Yet upon reflection, Stabler is thankful for the guidance he received from Bratuž. "Many of us have had teachers who changed our lives - someone whose wisdom and caring fundamentally altered the way we think, feel and look at the world," says Stabler. "For me, and for many other music students at Western, that teacher was Damjana Bratuž." Stabler adds from the moment he auditioned for her on a wintry March morning, Bratuž became "the centre of my gravity". His weekly piano lesson with her wasn't just the highlight of his week - it was his week. "She demanded the highest standards and introduced a new system of learning, with new vocabulary and new meanings," says Stabler, now a music critic for a newspaper in Portland, Oregon. "Actually, what she did was give us a new set of ears with which to hear music." "Professor Bratuž didn't teach to our limitations but to our imaginations," says Stabler. "If we didn't grasp a concept, she would say 'in 20 years you'll understand'. I'm just beginning to." Bratuž continues to enjoy retirement, saying the validation of her work has "seemed to come over the last dozens years." "These have been the best years, not only in engagements, but encounters in my field," says Bratuž, who spends much of her time speaking and performing internationally. "I think the thing that marked me the most was the war. It tells me not to miss what life brings you." What it has brought Bratuž is sense of calm and confirmation that her restless and pioneering intellect continues to make her a forerunner as a truly postmodern mind. Education: Doctor of Music in Piano Literature and Performance, with a Minor in Radio & Television, Indiana University (1967) Previous degrees, diplomas, and certificates: St.Louis, Paris, Salzburg, Trieste. At Western: taught Piano, Piano Literature, History (Bartók), Theory, Vocal Literature, Italian Diction. Introduced an interdisciplinary Course in Musical Semiotics at the Centre for the Study of Theory and Criticism (1992). Founded with cellist Tsuyoshi Tsutsumi renowned classes in Style & Interpretation. Created popular courses for non-music majors. Accomplishments: Awarded research grant by Italian Government (University of Bologna, 1989-90). Received Bartók Centenary Award from Hungarian Government (1981). As performer, lecturer, adjudicator, has appeared across Canada. Gives seminars and recitals in Finland, Italy, New Zealand and the United States. 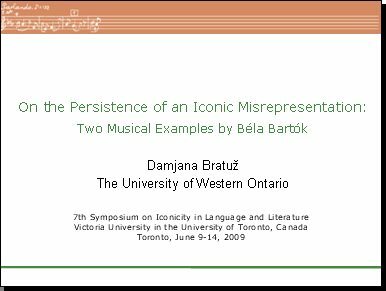 American Musicological Society Conference, Washington D.C.
Conference Paper: Transgression without Threshold: on the Missing, or Mistranslated Bard’s Prologue in Béla Bartók’s Duke Bluebeard’s Castle (see Bartókiana - Abstracts). Presented at the Lyrica Society for Word-Music Relations Session. Profile : Damjana Bratuž is Professor Emeritus at the University of Western Ontario in London, Canada. She is one of the country’s three musicians (with Zoltán Székely and Árpád Joó) who were awarded the Bartók Centenary Diploma and Memorial Plaque by the Hungarian Republic, for their activité créatrice[qui]a grandement contribué à la connaissance de l’oeuvre de Béla Bartók. 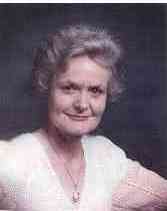 Her research had begun in the 1960s at Indiana University where she obtained her Doctorate in Piano Literature and Performance. 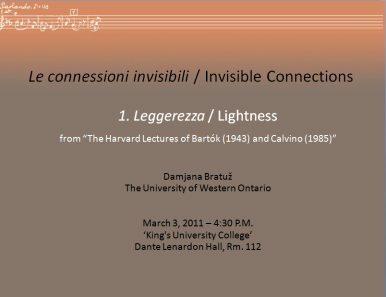 She had been awarded a Fulbright grant as a student from Italy [for a musical series for children she had created at Radio Trieste] and her academic life came full circle in 1990, when as a Canadian professor she received a grant from the Italian Government for research at the Semiotics Department of the University of Bologna. 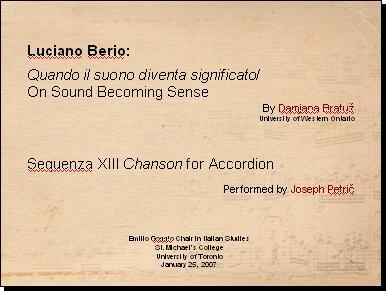 The multidisciplinary subjects of her conference papers, seminars and recitals, reflect her interest in the semiotics of performance; e.g., “Gestures of Lament “ (ICMS-8, Sorbonne, Paris, 2004); “Symbolic Gestures in the Performance of Clementi’s Didone abbandonata” (University of Toronto, 2004); “Musical Performance and the Dialogic Imagination” (a series of ten seminars, University of Helsinki, 2000); Le connessioni invisibili: The Harvard Lectures of Bartók  and Calvino  (University of Auckland, New Zealand); “Comme de longs échos: Reflections on Bartók, Rilke and Brancusi (Conference in Honour of Thomas Sebeok, Budapest); “On the Embodiment of Form:Polychronic Movement in Flaubert and Debussy” ICMS-6, Aix-en-Provence); “On the Creation of One’s Own Precursors:” Piano Recital of Liszt and Bartók Works (ISI, Imatra, Finland). Commemorating the 60th Anniversary of Bartók's Death. Lecture Recital, October 20th 2005. Boris Roubakine Recital Hall. Profile: Damjana Bratuz is, with Zoltán Székely and Árpád Joó, one of the three musicians in Canada who were awarded the Bartók Centenary Diploma and Memorial Plaque by the Hungarian Republic for their activité créatrice [qui] a grandement contribute à la connaissance de l’oeuvre de Béla Bartók. Hungarian musicologist Bence Szabolsci praised the novelty and he value of her earliest investigations, carried out in the 1960s at Indiana University. It was there that Damjana Bratuz first came across Bartók’s recorded collections of peasant music and began to trace the original idiom behind the composer’s scores. Since then, throughout her academic career in Canada, her study developed into a vast, imaginative inquire, faithful always to a performer’s task and point of view, that is, to examine, and contribute to, the reception of Bartók’s music. In piano teaching, her approach has represented in György Sebök’s words “a unique pedagogical help in the field, “one in which the analysis of Bartók’s musical material shared the results of her studies in illustrated programmes with a wide range of audiences, from the academic world to the general public, from major international centres to small Canadian communities. Her academic life came full circle when she received a research grant from the Italian Government for study at the Semiotics Department of the University of Bologna [she had to come to these shores as a student, with and American grant awarded for a musical series for children she had created at Radio Trieste, Italy]. Recent engagements in Italy have included courses, lectures and performances: e.g., in the University of bologna series La Musica nella Storia e nella Cultura, in the seminars “Incontri col Maestro” at the Accademia Pianistica di Imolaa, in the ‘Bartók and Berio’ programs of the Altrisuoni series sponsored by the Gramsci Institute (Marche), and in the “Musica e Spazio” programs created at the Parma Conservatory. 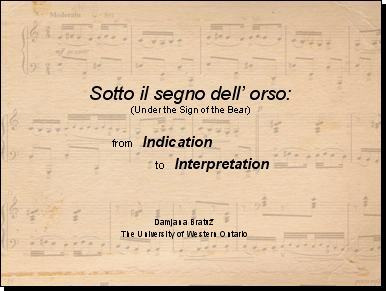 In these past seasons Damjana Bratuz has presented papers in bartókian musical semiotics at international conferences, most recently at the Sorbonne in Paris (Gestures of Lament), at the University of Chicago (on Notation), at Goldsmiths college in London (on the Sound-Spectrum), as well as in Leuven (Belgium), Bologna, Imatra (Finland), and Aix-en-Provence. Her larger interdisciplinary projects have been structured and offered in various formats: Musical Performance and the Dialogic Imagination as a series of ten seminars at the University of Helsinki; The Harvard Lectures of Bartók (1943) and Calvino (1985) as a seminar a the University of Ottawa, as a paper at the International Colloquium on Calvino at the University of Toronto, and as an illustrated lecture at the University of Auckland in the New Zealand; excerpts from Comme de longs échos, reflections on Bartók, Rilke and Brancusi, have been presented at conferences at Indiana University, in Budapest, and at the Accademia delle Belle Arti in Bologna. The title was borrowed from a page by Calvino, a meditation on coincidence on things that “present themselves” and ask for attention and observation. Calvino’s three terms remain the thread linking the observations in The Shaman’s Trail. Pianists are used to the summons of the composer’s indications as their guidance to the score. However, when the performer is ethnically and linguistically removed from the composer’s background, the task becomes one of the observing what one does not know, rather than of applying familiar relationships. Throughout the five pieces of the Out Doors suite, ancient kinetic and gestural patterns call the attention of a pianist’s hand and ear. The aim of this program is to make them audible. ALTRISUONI –L’INVENZIONE DEL NUOVO NELLA MUSICA DEL NOVECENTO: BÉLA BARTÓK E LUCIANO BERIO, Istituto Gramsci Marche/Conservatorio di Pesaro, Italy. INCONTRI COL MAESTRO, Docente di Seminario, Accademia Pianistica, Imola, Italy. MUSIC AND LITERATURE (Lecture and Recital), University of Auckland, New Zealand. Professor Bratuz didn't teach to our limitations but to our imaginations. She guided us with her eyes firmly on that far share. If we didn't grasp a concept, she would say, "In 20 years you'll understand."